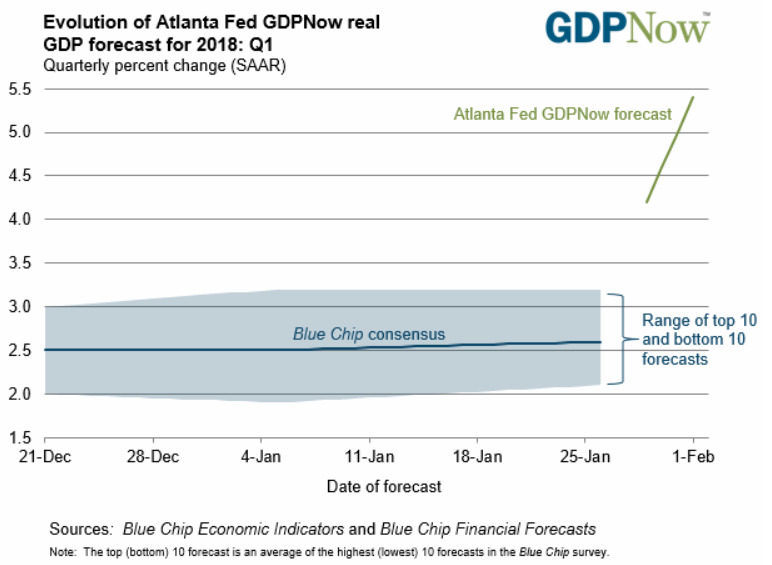 The Atlanta Fed’s GDPNow model forecasts 5.4% gross domestic product-growth in the first quarter. That’s much higher than what even the most bullish economists expect, but is based on only one month’s worth of data for the quarter. Many economists expect the economy to grow closer to 2.5% through 2019. One model that forecasts the US economy’s performance could shock even President Donald Trump if it ends up being accurate. 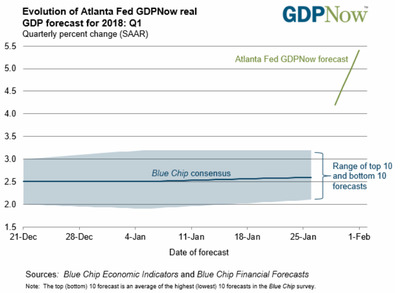 The Atlanta Federal Reserve’s GDPNow model projects that gross domestic product would increase at a 5.4% annualized rate in the first quarter. The last time the economy grew that much was in the third quarter of 2003. If correct, this would be the first period of more than 5% growth since the third quarter of 2014. Additionally, the forecast is much higher than that of the most bullish economist polled in the Blue Chip forecast. The model spiked Thursday after the Institute of Supply Management released monthly data on US manufacturing, which raised the outlook for the biggest driver of growth: consumer spending. Also, data on construction spending raised the Atlanta Fed’s forecast for business investment via real private fixed-investment growth. Trump defied many economists early last year and projected 4% annual growth, raising that to 6% after Republicans passed tax cuts. His vow sought to lift the economy above the roughly 2% annual rate that it remained in, on average, during President Barack Obama’s tenure. But it could be tough to achieve. The consensus among economists polled for the Blue Chip forecast is growth that’s closer to 2.5% or less through 2019, even when the impact of lower taxes and more consumer spending is taken into account. That’s primarily because of bigger issues like a decline in worker productivity, an ageing population, and slack in the labour market. A more obvious caveat for the Atlanta Fed’s model is that it’s based on data from January alone. But the extent to which it falls back towards what many other economists are forecasting, and whether it holds up instead, will be interesting to keep track of.